We're one month into 2019, and the year’s biggest fashion trends are already starting to take shape. With the buzzy new designer bags fashion girls are adding to their shopping carts, a controversial denim trend that has returned, and the “boring” spring color Meghan Markle just endorsed, there is no shortage of new happenings in the world of fashion trends this year. So what are we noticing when it comes to new shoe trends in 2019? It turns out there are already plenty of cool new styles fashion girls are adopting into their wardrobes. 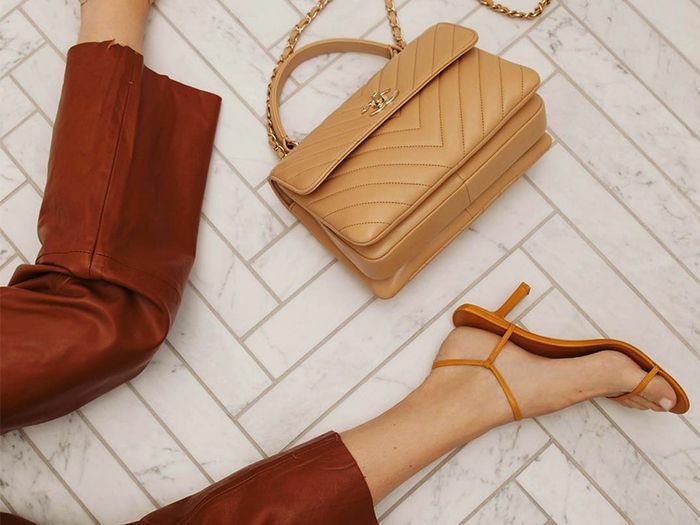 From sneakers to heels to the “ugly” sandals everyone will own in a few months, these are the six new shoe trends to know about right now. Go on to see how the fashion set is wearing them, and shop my edit of styles to add to your closet. Yes, get ready for sport sandals, everyone. These are destined to be the shoes of 2019 with fashion insiders already on board. Galactic heels and sneakers finished with metallics and futuristic shapes are suddenly appearing all over Instagram. Logo mania has been around for seasons now but has hit an all-time high for spring 2019. The higher ⬆️ the heel, the less likely I am to move from this position. While beige is the color everyone is talking about, orange is the bolder hue we're seeing everywhere. Last fall, Who What Wear's managing editor, Michelle Scanga, reported on the pyramid heel trend. It has since only picked up steam. More and more, I've been noticing Mary Janes popping up on the fashion scene. Chanel recently brought them back, so I expect we'll be seeing plenty more of the trend.